John 21:15-25 When they had finished eating, Jesus said to Simon Peter, “Simon son of John, do you love me more than these?” He said, “Yes, Lord, you know that I love you.” Jesus said, “Feed my lambs.” Again Jesus said, “Simon son of John, do you love me?” He answered, “Yes, Lord, you know that I love you.” Jesus said, “Take care of my sheep. “The third time he said to him, “Simon son of John, do you love me?” Peter was hurt because Jesus asked him the third time, “Do you love me?” He said, “Lord, you know all things; you know that I love you.” Jesus said, “Feed my sheep. Very truly I tell you, when you were younger you dressed yourself and went where you wanted; but when you are old you will stretch out your hands, and someone else will dress you and lead you where you do not want to go.” Jesus said this to indicate the kind of death by which Peter would glorify God. 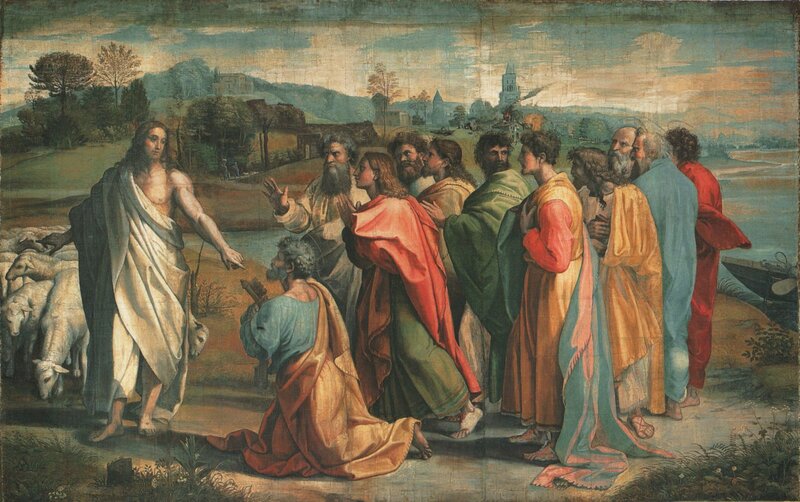 Then he said to him, “Follow me!” Peter turned and saw that the disciple whom Jesus loved was following them. (This was the one who had leaned back against Jesus at the supper and had said, “Lord, who is going to betray you?”) When Peter saw him, he asked, “Lord, what about him?” Jesus answered, “If I want him to remain alive until I return, what is that to you? You must follow me.” Because of this, the rumor spread among the believers that this disciple would not die. But Jesus did not say that he would not die; he only said, “If I want him to remain alive until I return, what is that to you?” This is the disciple who testifies to these things and who wrote them down. We know that his testimony is true. Jesus did many other things as well. If every one of them were written down, I suppose that even the whole world would not have room for the books that would be written. Pope Leo X commissioned a set of tapestry designs, or cartoons, from Raphael in 1515. The ten cartoons depicted episodes from the lives of Saints Peter and Paul. Raphael here combines the two New Testament passages on which the catholic church bases its authority, that of Matthew 16:18-19 and this passage in John where Jesus orders Peter three times to feed the sheep - making it obvious that he actually charges Peter to take care of the believers. The tapestry was made in the workshop of the weaver Pieter van Aelst and is now in the Vatican Museums. Although Raphael's cartoons have been prized since the eighteenth century as independent works of art, in their own time they were seen as a stepping stone in the creation of the final object - the tapestry. Raffaello Sanzio da Urbino (1483 – April 1520), better known simply as Raphael, was an Italian painter and architect of the High Renaissance, celebrated for the perfection and grace of his paintings and drawings. Together with Michelangelo and Leonardo da Vinci, he forms the traditional trinity of great masters of that period. Raphael was highly admired by his contemporaries, although his influence on artistic style in his own century was less than that of Michelangelo. Mannerism, beginning at the time of his death, and later the Baroque, took art in a direction totally opposed to Raphael's qualities; "with Raphael's death, classic art - the High Renaissance - subsided", as Walter Friedländer put it. However, he was soon seen as the ideal model by those disliking the excesses of Mannerism.